It was an early Wednesday morning start for Terry Harper and pals, all present and correct in the bar of the Blue Bell Inn in Weaverthorpe, the traditional starting point for Terry’s shoot days at Langtoft. 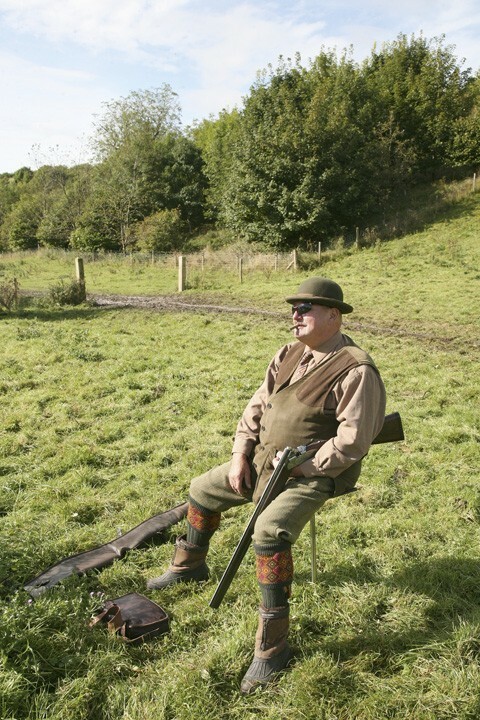 During a previous visit to his shooting ground at nearby Cotton Dale, Terry had spoken fondly to me of this “good little farm shoot”. But in retrospect it is clear he was under-stating things. While it may be a small shoot there are some towering birds here. I visited Warter Priory the day after my visit to Langtoft and it struck me on arrival at Warter just how similar they looked; perhaps not surprising as both shoots share the same rolling chalk dales that epitomise the Yorkshire Wolds. The dales might be steeper, the bags larger and the birds higher and faster at Warter, but Langtoft matches it for sporting soul. 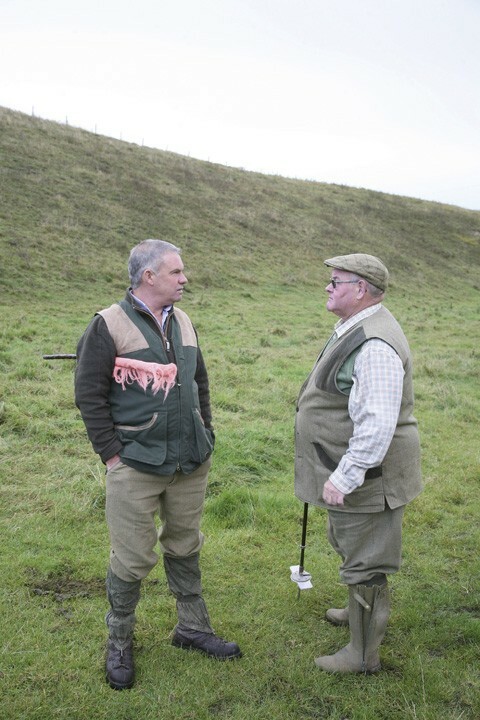 Headkeeper Jeremy Brown (left) in conversation with Terry Harper, a regular guest at Langtoft. Terry held court throughout our breakfast of coffee and bacon rolls at the Blue Bell. The guns, all known to one another through some degree of separation, hushed when headkeeper Jeremy Brown appeared as a silhouette in the doorway to ask that the draw be conducted. Catching the guns unawares is never a bad idea, because collecting guns together can sometimes be like trying to assemble family members for wedding photographs. Jeremy didn’t have to wait long before everyone was outside checking they’d remembered shotguns, cartridges, wellies and anything else they had to remember not to forget. Steve “Jazz” Woodall is part of the loyal picking-up team at Langtoft. 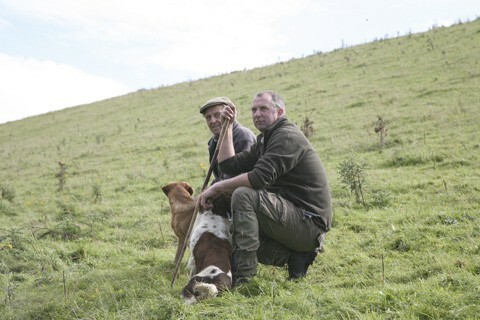 Jeremy, a game farmer by trade, has leased the shoot from a long-time farming friend for the last 10 years. 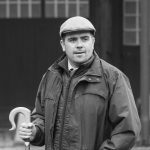 Richard, his 21-year-old son, helps to keeper the land, 700 arable acres with dales spread out like twisted fork tines throughout its six drives. They shoot partridges at Langtoft with a few pheasants later on in their 18-day season, a third of which are taken by Terry’s team, which has been visiting for the past five years. The beaters are local, naturally; a smattering of ladies young and old set amongst men large and small. As Jeremy pressed palms around the farmyard, everyone, including land owner Mr Connor (with yellow flag) bid everyone else a good morning. I rode with Terry and his loader for the day, Terry Ling, who works for Terry at Cotton Dale Shooting Ground. As we drove, another gun who was with us explained, without need of coercion, why he preferred the sport around this part of the world to that found “down south”, especially when the wind gets up. 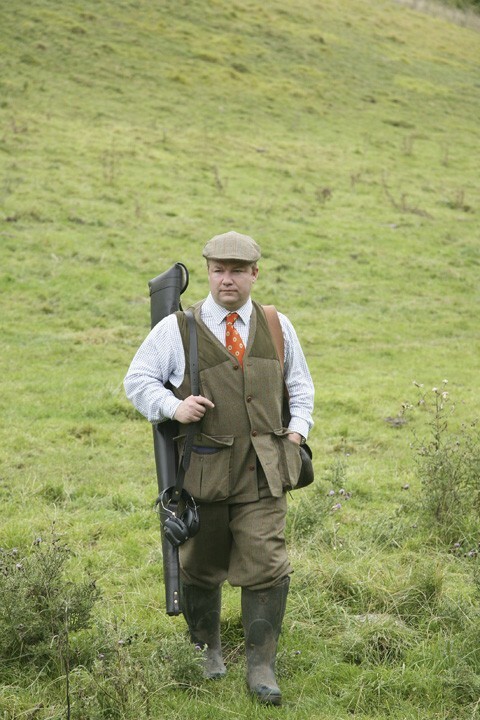 “I go shooting in Wiltshire, and these Yorkshire birds are far better than anything you’ll find down there,” he said unequivocally. Middle Maize marked the moment the day quickly moved through the gears and illustrated just what Langtoft’s birds could do. The shoot suffers from all of the usual problems encountered by shoots of this size: the odd gun short, the maize not performing as well as it should etc. Thankfully, the farmers whose land Jeremy shoots over are laid back. 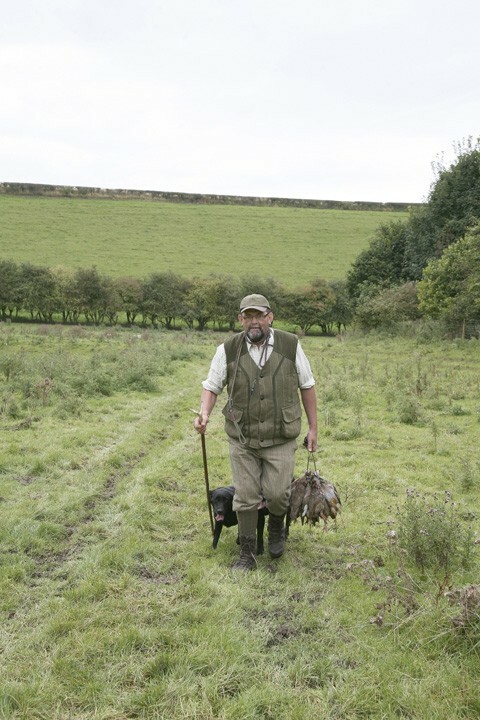 Pegs become available via word of mouth, and the typical guest is attracted to strong, fast partridge that might cost a few pence more elsewhere. Pickers-up Bob Gauge (left) and Trevor Ireland search the gaps in the trees waiting for the first coveys to burst across the line. Guns who’ve known each other since before they could hold a shotgun are almost always the best to be amongst. It was an interesting experience to watch Henry Thirsk (he with the bowler hat). A gentleman farmer known around the county as I understand it, he rested himself on the leather of a stout shooting seat throughout every drive. The smoke from cigars he chewed in quiet contemplation between shots billowed back over a shoulder towards his mud-splattered black Range Rover with the wording carefully re-arranged to read Hang Over. 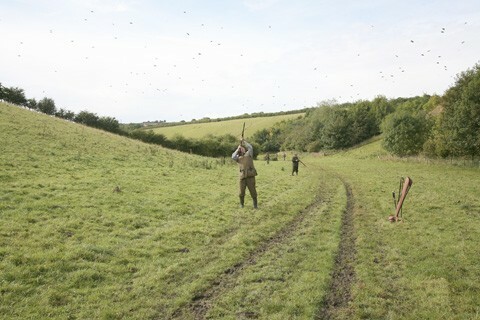 Any man who sits down to shoot must have a degree of confidence in his own ability as he reaches for the birds overhead. Cartridges, like the birds he felled, were ejected economically, his shades never steamed, his brown shirt never spoilt by perspiration. Like a bass guitarist he contributed a good deal to the enjoyment of others, but you just didn’t really know he was there. Henry Thirsk shot from a seated position and was bowler hatted throughout the day. After a short break for something or other – I declined an offer of one of Henry’s cigars – the guns turned 180 degrees ready for Bushfield. Cloudy skies that had fallen silent for a while were soon lit with flashes of gold and gunpowder, the birds as infused with adrenaline as the guns themselves. As morning turned to afternoon I mentally added Langtoft to the list of shoots I would try to emulate if I ever had the means to do so. It’s walkable in a day, you’re never far from familiar faces, no one is meticulously clock watching and everyone knows that every job counts for something. Robert Everitt from Hull Cartridge left Langtoft with warm barrels and a strong desire to return soon. The day closed on a special note. Winston Churchill is thought to have shot on this ground at some point and the last drive, named in his honour, was, according to one gun “as good a drive as you’ll see all day”. It was not an easy landscape to shoot over, the narrow arc of fire created by another pair of steep banks climbing towards a featureless horizon requiring quick wits. With the afternoon wind shuffling the grey clouds eastward the birds flew high and fast. There was always something good enough to shoot on Churchill and indeed Langtoft itself, a compliment to a shoot of this size. For more information about days at Langtoft contact Jeremy Brown on 07917 367307.